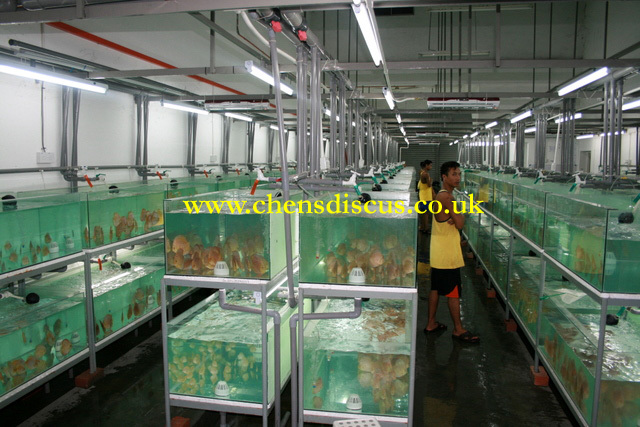 In May 2007, I went to Malaysia and Singapore to participate in Aquarama and visit some of the breeders and their farms. I have summarised below my experience during my trip to the Far East. As most of you know, I visit the farms personally to select my stock; this experience was very different from my previous visits. Landed in Singapore on Thursday, 24 May 2007 and took a taxi straight to the Suntech Convention Centre, where Aquarama 2007 was being held. They refused to let me in as I had neither a participant nor a trader pass as my dear friend Jeffrey Tan had already got it issued on the 21st. It was practically impossible to locate Jeffrey as he had been out with some friends. Luckily, I had a copy of the confirmation letter from Aquarama and presented it at the registration counter upon which I was issued with a temporary trader pass. It took me nearly 1 hour to check all different participating categories like goldfish, arowanas, guppies, bettas, marine tank, planted tanks etc. I left the discus section as my final destination. It was like a dream come true with so many top fish and varieties competing against each other. Each and every fish deserved a prize as these are not the everyday fish that you come across. Was a bit surprised as I expected to see a lot of 8-9″ fish at the show. But I would say the biggest fish at the show measured just about 7″. We walked to the Singapore Discus Society pavilion and were met by Dr. Andrew Soh. We had a very good chat on discus strains, genetics etc and he asked me if I had his book, the ‘Naked Truth’ to which I acknowledged and told him that it is one of the best books I have come across. He wanted to know if I was interested in getting some ‘discus Viagra’ (pro-more) to which I asked him to suggest some medication to stop my fish from breeding in my show tank:-):-):-). Jeff told me that I should get Andrew’s second book on ‘human breeding’ and they started laughing. I was a bit confused initially and later on realised that he had written a book on ‘human breeding’. We were later joined by Dr. Sun See Seng, President of the Singapore Discus Society. 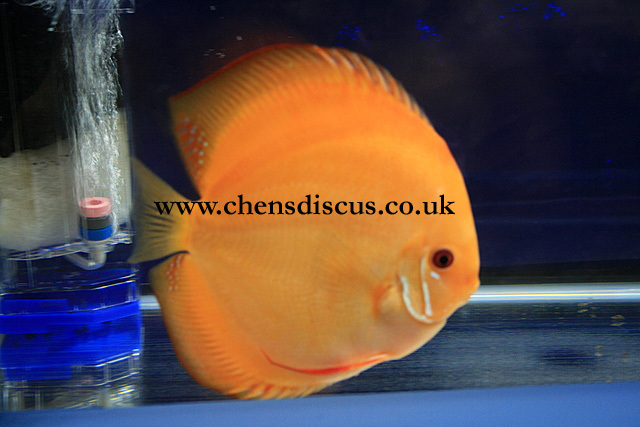 He informed us that he is launching his new book, “Trophy Discus” and gave us a free copy. I briefly scanned through the pages and saw some interesting topics on selecting good fish. He invited us to the discus society dinner the next day, but we politely refuse it as we had plans to visit a few farms in Singapore. We had an interesting chat on the new strains currently being developed in Singapore and the recent albino strains coming up. Our meeting was interrupted by Bernd Degen from Germany as he wanted to say goodbye. During our conversation, he mentioned his interest to keep in contact with me. We parted company after I promised to get in touch with him upon my arrival in the UK. Finally met Tony and other discus breeders from Malaysia, Jeffrey Yang, Na Chung (NA Discus), Chris Chua(NA Discus), Edmund Lin(NA Discus), Ricky Lim(Hong Xin Aquatic Trading & Service) and Adam Tan(President of Discus Society Malaysia). I was introduced to them and after a brief chat decided to have lunch at the food court on the ground floor. After lunch, we parted company as I was too tired and wanted to go back to the hotel. Later, we went for dinner with the Malaysian breeders and learnt a lot regarding the new strains they are developing, the practices they follow, the problems they have etc. It was not until 4 am that we went to bed and I knew what in store for the next few nights. The same was to follow every other night from then on. The following day we went to Suntech and checked on the fish. 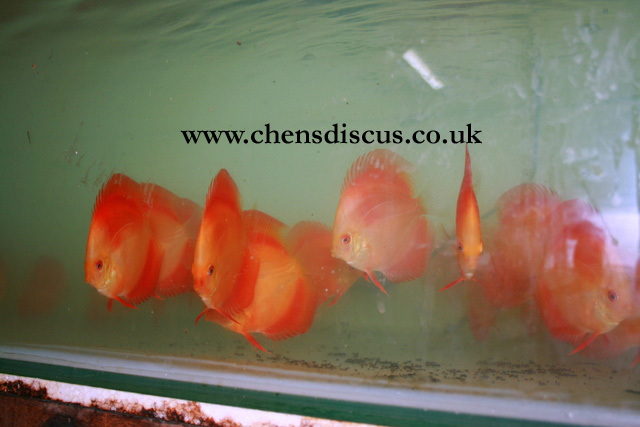 Some of the fish looked really unwell and some of the show fish started to show signs of bacteria infection. It did not matter now as the judging for the fish was completed the previous day, but it was sad to see some quality fish falling sick. I asked Tony if anything can be done for the sick fish and was told that nothing can be done until the benching out of the fish on Sunday, 27th. Left to right : Tony Tan, Chris Ingam, Francis Hu, Jeffrey Tan On Friday, I was asked to wear my Discus Society Malaysia shirt as they wanted me to be part of their group. At the presentation ceremony, Tony wanted me to collect one of his award on the stage and when asked about the reason, he told me that since he is my supplier, he wanted me (the seller) to represent him at the stage, which many breeders do often. Met with someone from the UK at the ceremony, I think he called himself Chris Ingam from Plymouth Discus:-):-):-). Chris, it was good to catch up with you mate. Atleast, I was not the only one from the UK. On Saturday evening, we visited a breeder locally in Singapore at 11pm and checked out his Albino Blue Diamonds. I was quite keen on buying some adults, if he had some. I was told that only juvenile’s were available for sale as adults are currently being distributed between breeders and is not easily available for sale. I was not too happy buying 2″ albino blue diamonds for such a high price quoted to me. On the last day(Sunday), I met up with my friend from Indonesia and visited one of his friends farm. I finally met one of the most popular breeders in Singapore, Roy Khoo at his farm. He gave me permission to take picture of his breeding pairs and his breeding stock. I must say, he had nearly 40-50 pairs and almost every pair had a minimum of 150-200 fry. 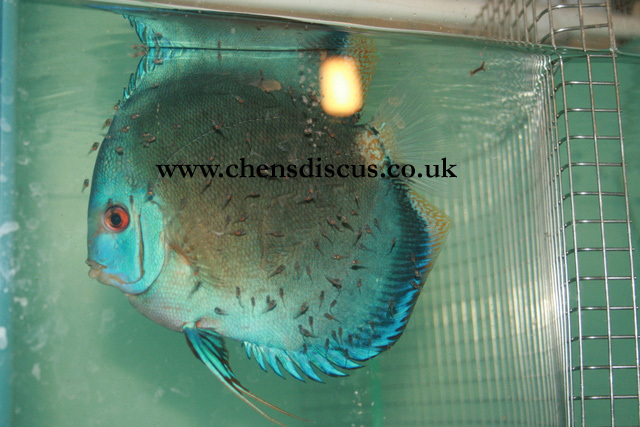 One of the best pair was a blue diamond, where the male and female were separated by a mesh. The male had atleast 100-150 fry on its body and the female had another 100-150 fry(see picture of the female with fry). The only reason I can assume was he separated the pair so that the fry had more chance of feeding properly if both parent’s were feeding the fry simultaneously. I was very impressed with the quality of his fish and I should confess that he has one of the best red strains I have ever seen. 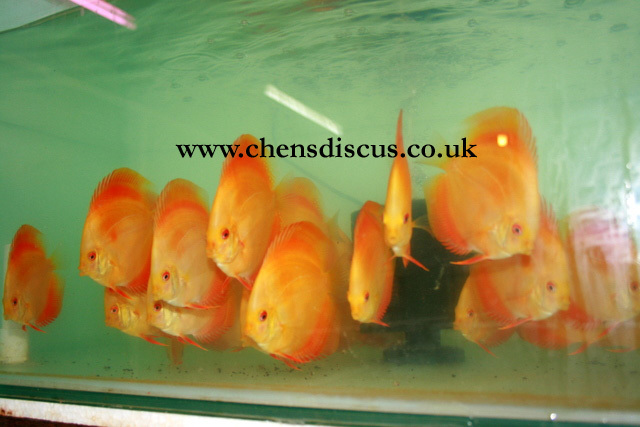 He had some stunning red melons, golden melons, albino golden etc. I was so impressed with his reds and golden that I did not have a choice but to buy all his juvenile red melons (40) and golden melons (30). He wanted to know if I wanted the actual fish(their parent) that won the 1st prize under the solid yellow category. Though it was very tempting, but knew the price of the fish is not going to be cheap. I had to turn the offer down as I was happy that I had atleast got some juveniles from show winning parents. On the last day at 7pm, we benched out the fish from the competition and drove straight to Malaysia. We drove from Singapore to Malaysia in Tony’s car and chatted the entire 5 hours on various discus topics. I convinced Tony and Jeffrey to write an article for my website and I should have then in the next few weeks. The original plan was to visit Na’s discus farm on the way up, but it was already quite late and we had a busy day ahead. Hence, we postponed the trip to their farm during my next visit. The following day, Jeff picked me up from the hotel very early and we drove straight to Tony’s Farm in Ipoh. As usual, Jeff shared some of his discus secrets during the 3 hour drive. When we finally reached Tony’s farm, I was told that he did not sleep and was culling his fish. When we met up, I asked him why he could not let one of his employees to do the work. I was amazed when told that he had to do it himself to ensure the quality is maintained and for his personal satisfaction. After a brief chat, he took me to two of his new farms that he had started last month and a new place that he will be setting up next month. Now the best part, I had always been waiting for – personally selecting the fish. The first question I asked him was – “I assume all fish are for sale including your personal fish to which he said, YES!!!! This was the ideal opportunity for me to get hold of show quality fish as Tony had been preparing quite of lot of his fish for Aquarama 2007 fish competition. I was given a fish net, a bucket and a marker (to write my name on the selected tank) and a few empty tanks were prepared for me to accommodate my selected fish. I got down to work and started selecting a lot of fish. There were instances when I had select the whole tank as I could not find a single fish I did not like. After a while, I lost count of how many fish I selected and asked Jeff if he could help me count and give me an approx number. I was told about 500-600 fish and I could not believe as I still had to visit 4 more farms to select fish. He took me to one of his smaller farms (around 50-70 tanks) where he usually hides his breeding stock and not every visitor is taken to this farm. I had to convince him to part with atleast 6 fish from each strain like Chequerboard Pigeon, Blue Diamond (yellow base), Golden Melons, Red Dragons, and Electric Dreams etc. At the end of the day, I would have selected around 1000-1500 fish from all his farms. To be honest I was not too worried as I knew my new fish house will be ready by end of June and I will be able to stock them without any problem. We visited one of Tony’s network breeders and I selected some chequerboard pigeons and albino blue diamonds. At the end of the day, it was so relaxing to finally have dinner in my favourite ‘air-conditioned’ restaurant after having spent the whole day sweating at 95 degree Fahrenheit. The next day was spent on chatting and visiting a few more people and a dry goods wholesaler where I picked up some equipment for my new fish room. We had some time left before I had to leave for the UK and we decided to visit the spa at the Holiday Inn. For a moment, I forgot that I had come for a business trip as it was great to finally relax and for a change not talk about ‘discus’, though we did talk about arowanas and stingrays :-):-):-). After dinner, Tony and Jeff dropped me at the airport and I finally had some time to reflect on my hectic trip. I would like to thank Tony, Jeffrey, the discus breeders and everyone for the hospitality shown to me during my stay. Never ever did I get the feeling of being a foreigner and would like to show them ‘our UK way’ of hospitality when they visit us. Last but not the least; thanks to my friend Mala, who took care of my fish in UK during my absence and quite remarkably managed to kill ONLY one fish out of around 200.